1. 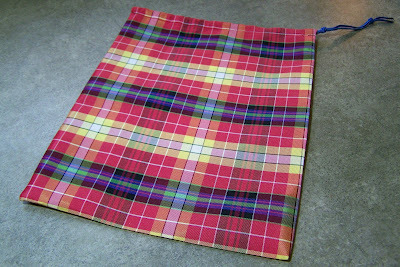 Purchase festive, plaid taffeta at garage sale. 2. 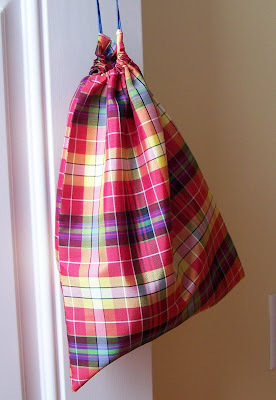 Sew simple drawstring totes for knitting friends. 3. Adorn with cute knitting tags downloaded here. 4. Make dear knitting friends happy (I hope) to have a sack for their little knitting projects. Love it, we use drawstring bags all the time, I love that fabric! Of course PEAR and French Picnic love the stealth part of your projects, so fun! I am certain that your knitting friends will love them! I’ll need to talk one of my sewing buddies into making me a few since I so rarely sew these days (and probably won’t do much of it until after we get moved this summer). Really sweet idea! Very pretty and useful too. I wish I could go to a garage sale like that! Very cute! I love drawstring bags. I have a couple fabric ones for my knitting projects, and I like to knit them, too. Thanks for the link to Laylock, that’s a nice site. 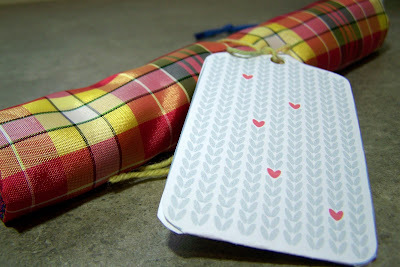 Love the fabric, and the tag is cute, too! hi.. thnaks for sharing.. Nice project..
looking for something special for this xmas..? The dresses you have made for your daughters are incredible. I love your dresses for your daughters. Mine are still small, and when I look at your sewing for your children, I see all the fun I’ll have in the future.